Good leaders know the importance of having regular one-on-ones with their team members. And it is no surprise that Gallup’s 2015 management report found that employees who have regular meetings with their managers are three times more likely to be engaged than employees who do not. So…what is a one-on-one, why do them and what should we cover in it? A one-on-one is simply a discussion with a leader and their team member, held at a frequency that suits both parties. Their purpose is to engage and inspire future excellent performance. Parties involved in effective one-on-ones say the best frequency is anywhere from once a week to once a month, and they last anywhere between 15-60 mins (depending on regularity). One-on-ones should not be seen as additional work of a people leader – they are the work of a people leader! Studies have shown that the best way to ensure frequency is to have check-ins be initiated by the team member—rather than by the team leader. Having a regular booking is an important feature – with either party entitled to one ‘reschedule voucher’ every 6 months. A tone that sits somewhere between formal and informal often works well, with a lose agenda that touches on each of the 4 themes described above. 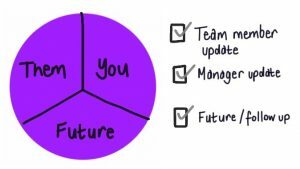 Some leaders we have worked with suggest a general guide of 1/3 for team member update, 1/3 for manager update and 1/3 about future / follow-up is a useful rule of thumb. 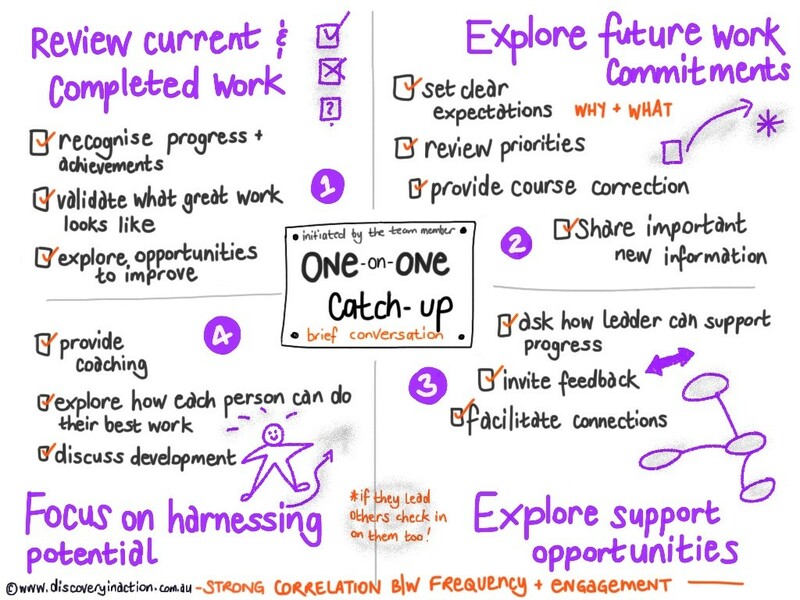 So…next time you think about having a one-on-one you may like to download a copy of our 4 themes visual and / or our one-on-one planning worksheet. Click here to access the one-on-one planning worksheet. Click here for a copy of the visual.